The Pressures Of Being An Interpreter At A High-Stakes Summit President Trump doesn't speak Korean and little is known about Kim Jong Un's English skills. The best interpreters serve as both linguists and diplomats. They understand the politics behind the words. Igor Korchilov (center) served as interpreter when Soviet leader Mikhail Gorbachev and President George H.W. 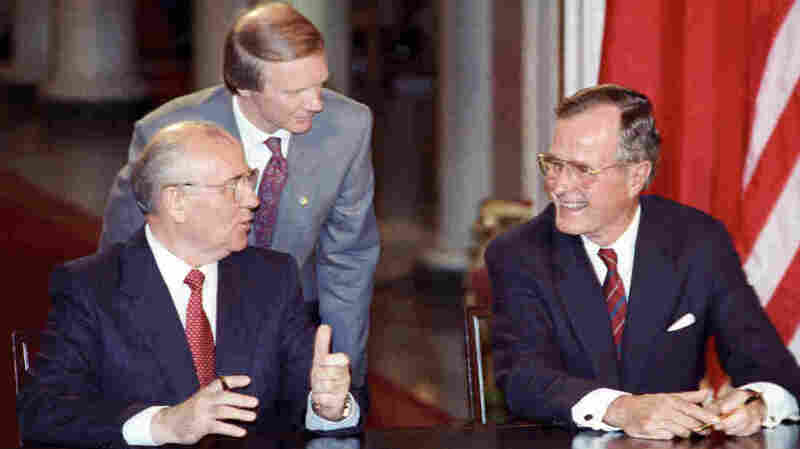 Bush met in 1990 to discuss arms control. Former President George H.W. Bush was deep in nuclear negotiations with Soviet leader Mikhail Gorbachev. The 1990 talks, focused on an arms control treaty, were suddenly interrupted when a seasoned Soviet interpreter made a critical mistake. The interpreter, Igor Korchilov, said the word "verifying" in English, instead of "verified." Everyone in the White House Cabinet Room froze and turned toward him — including his boss. Gorbachev quickly said: "No, no — I never said that." "To this day, I still feel extremely embarrassed," Korchilov tells NPR. He worked with Gorbachev from 1987 to 1990. It was a seemingly minute detail. But in the context of these talks, the word "verifying" meant that the Russians had unexpectedly sided with the U.S. on one point in the long-sought agreement. The discussion was on an Open Skies proposal, in which both sides could fly over each other's territory to verify compliance in arms control agreements. The Soviets and the Americans didn't agree on whose aircraft should be used for the inspections — the verifying party (the U.S.) or the verified party (the Soviet Union). Korchilov interpreted Gorbachev as saying: "The aircraft to overfly territory for inspection purposes should be made available by the verifying party at the disposal of its crew." "At that moment I wished the earth could swallow me up," Korchilov wrote in his 1997 memoir, Translating History: 30 Years on the Front Lines of Diplomacy with a Top Russian Interpreter. He wondered if he had accidentally changed the direction of superpower diplomacy. He approached the U.S. president later to offer his apology. "He made a stern look, put his arms in his pockets and said, 'Relax, the good news is that you didn't start World War III.'" Korchilov also apologized to Gorbachev, who said, "Oh, don't worry, Igor. Only those who do nothing make no mistakes." In closed-door meetings at the highest level, interpreters face the pressures of global diplomacy. Every word matters, and a slip-up can have monumental consequences. That's especially true for the June 12 summit meeting between President Trump and North Korean leader Kim Jong Un. President Trump presents his own challenges for interpreters. He's known to go off-script. His former campaign adviser Anthony Scaramucci once said, "Don't take him literally, take him symbolically." And earlier this year, The Washington Post reported on the difficulties of translating Trump's profanity, such as his comment in January about "shithole countries." 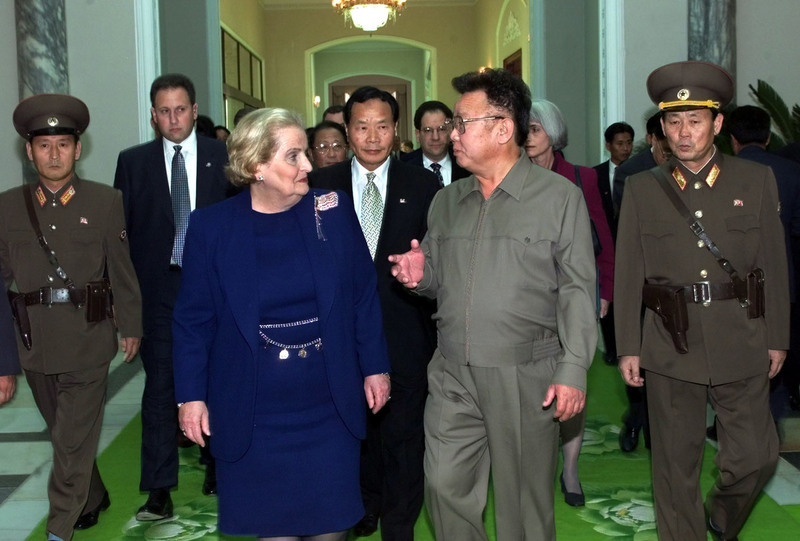 North Korean leader Kim Jong Il and Secretary of State Madeleine Albright met in Pyongyang on Oct. 23, 2000. Tong Kim (between Albright and Kim) served as the State Department interpreter. Uncertainty, however, is part of any language. That's why the best interpreters serve as both linguists and diplomats — they understand the politics behind the words. For those who've interpreted top-level meetings, they've lived the pressure. On Oct. 23, 2000, Madeleine Albright, then secretary of state, became the highest ranking U.S. official ever to set foot in North Korea. She met former leader Kim Jong Il, clad in his trademark khaki pants and jacket, at the Pae Kha Hawon state guesthouse in Pyongyang. Albright's trusted interpreter, Tong Kim, followed close behind. "That was the most important meeting I have ever interpreted for," says Tong Kim, who served as the senior Korean language interpreter at the U.S. State Department. Albright was trying to persuade the regime to abandon its long-range missile program. To prepare, Tong Kim needed to learn the jargon of arms control. He reviewed top-secret briefs and read a dozen books on nuclear bombs. "I kept reading and reading," he says. "Reading every article in newspapers and academic journals — it was total immersion, in the task of preparing myself." When he first began interpreting, he says, "I spoke like a South Korean. And they did not seem to appreciate it, although they could understand my renditions, perhaps not as readily, though." So he perfected a North Korean accent. "I picked up their language, their intonation, their dialect," Kim says. "And that gives them some trust." Albright's meeting was meant to pave the way for President Bill Clinton to visit Pyongyang, but missile talks between North Korea and the U.S. stalled just as Clinton left office. "I almost got us both killed, didn't I?" Former Vice President George H.W. 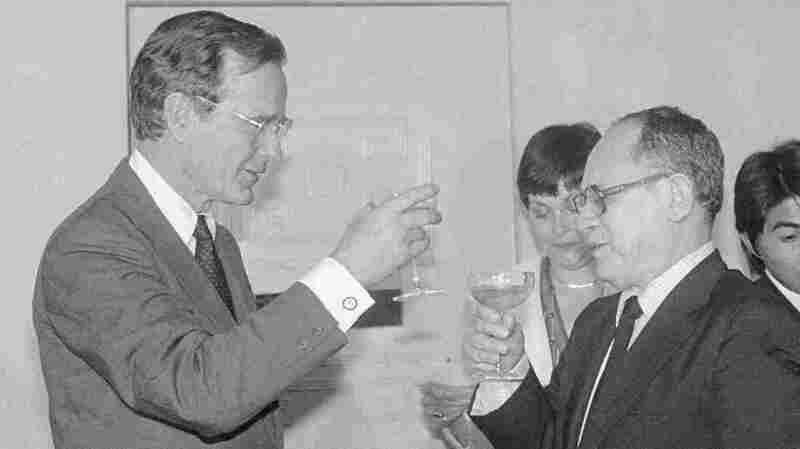 Bush met with El Salvador's President Ãlvaro Magaña in 1983. During the toast, Bush relayed President Ronald Reagan's concern over killings by right-wing death squads. Stephanie van Reigersberg (center) was Bush's interpreter. In December 1983, George H.W. Bush, then Ronald Reagan's vice president, went on a secret mission to El Salvador. The country was in the midst of a civil war. Stephanie van Reigersberg, who led the interpreting division at the State Department and specialized in Spanish, was assigned to accompany him. They flew in on Black Hawk helicopters, through the Salvadoran mountains to a presidential villa. Only a handful of U.S. officials knew about the vice president's planned meeting. Bush was there to deliver a warning to a group of military commanders about the government's brutal death squads. "The whole military senior staff was there and they all had weapons on their laps," van Reigersberg recalls. Secret Service agents recommended the vice president call off the meeting over security concerns. But Bush refused — he was determined to confront the commanders. "Basically, he cussed them out," van Reigersberg says. "Having a woman interpreter using that kind of language really got their attention. You are so concentrated on delivering the message that it's only afterwards that you say, 'Oh my heavens.' And after the meeting, Bush said, 'Well, I almost got us both killed, didn't I?'" Soviet leader Mikhail Gorbachev met with President Ronald Reagan in Washington in 1987. Dimitry Zarechnak (far left) served as the U.S. interpreter during their meeting and faced a conundrum presented by the English word "adversary." Pavel Palazhchenko (second right) served as the Soviet interpreter. 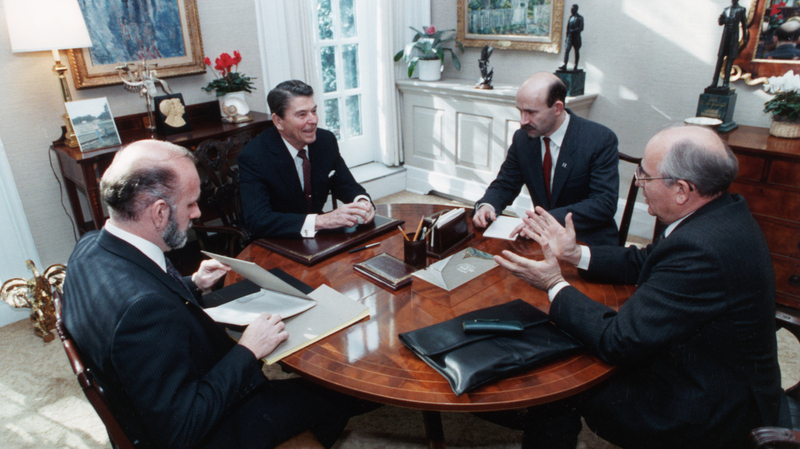 Years of negotiations led to a U.S.-Soviet summit in Washington, D.C., in December 1987. President Ronald Reagan welcomed his Cold War rival Gorbachev to the White House, in hopes for a new era of peace. During the official welcoming ceremony on the White House South Lawn, Reagan famously said: "Today marks a visit that is perhaps more momentous than many which have preceded it, because it represents a coming together not of allies — but of adversaries." "We were just agonizing over this word 'adversaries,'" said Dimitry Zarechnak in an interview with NPR in 2001. He was interpreting the president's speech that day. The Russian word for "adversaries," protivniki, sounds similar to a word that means "disgusting," protivniy. "In English," Zarechnak said, "you can have a noble adversary. In Russian, it sounds terrible." So instead of repeating the word "adversaries," Zarechnak used a Russian word for "competitors." Gorbachev gave a slight nod — and the summit was underway.